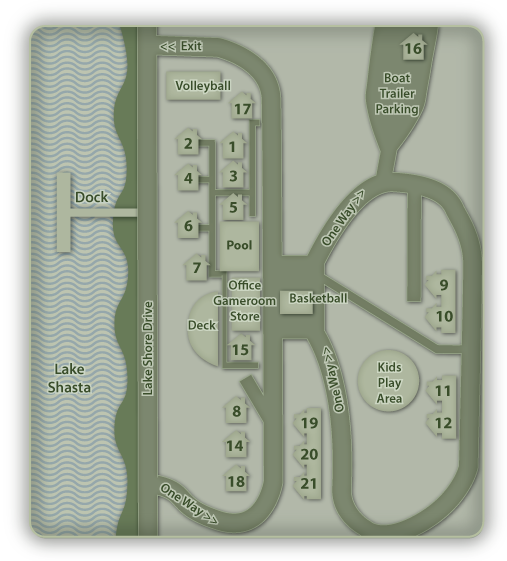 Thank you for choosing Tsasdi Resort as your choice in Lake Shasta Lodging. Our resort has proudly served generations of families as they gather together as well as those who are looking for quick getaways. The resort staff is ready to assist you with any questions or concerns you may have. To make a reservation, visit our reservations page. For any other questions, please use our contact information to reach us. Follow interstate I-5 to approximately 26 miles north of Redding, CA. Take the Lakeshore Dr. exit, (exit 702) turn left under the freeway, then left on Lakeshore Drive. Follow Lakeshore Drive for about two miles, make a right turn up the driveway at the Tsasdi Resort sign. Travel South on I-5, take the second Lakehead exit (exit 702, Lakeshore/Antlers), turn right off the freeway then left on Lakeshore Drive. Follow Lakeshore Drive for about two miles, after crossing the second small bridge, make a right turn up the driveway at the Tsasdi Resort sign.